It didn't take Wauwatosa East baseball coach Pete Schwichtenberg long to know he had something special in Jeff Mason. The Red Raiders varsity needed some pitching during Mason's first year with the program, so the call went out to the freshman team. "We talked to the freshman coach and he said Jeff was throwing strikes," Schwichtenberg recalled. "He had his first start - we were going to try and take it slow with him and get it going - and he had a complete game against (West Allis) Hale. "After his first start the coaches said 'This kid's not going anywhere. He's going to stay up with us because we'd been struggling to shut a team down and he was able to do that right away,'" Schwichtenberg said. "He didn't throw that hard, but he hit his spots. He never got rattled, which is huge. He has always been a kid who would just throw strikes. He was a really quiet kid. He didn't really know a whole ton of guys on the team. "But when he went to the mound, he was a completely different kid. He looked like he was in control. Nothing really bothered him being on varsity. It was really cool to see that. He was ready to compete right away." Having a successful freshman year helped Mason the following season. "I think it helped me a lot because I didn't expect to have that success," he said. "I went into my freshman year not knowing what to expect exactly. If I wasn't the best on the team, I would have been fine not making the freshman team if I really wasn't that good. "But knowing I was good enough to be playing it helped me a lot to really get a lot of work in in the off-season and I trained to make this a real dream come true." 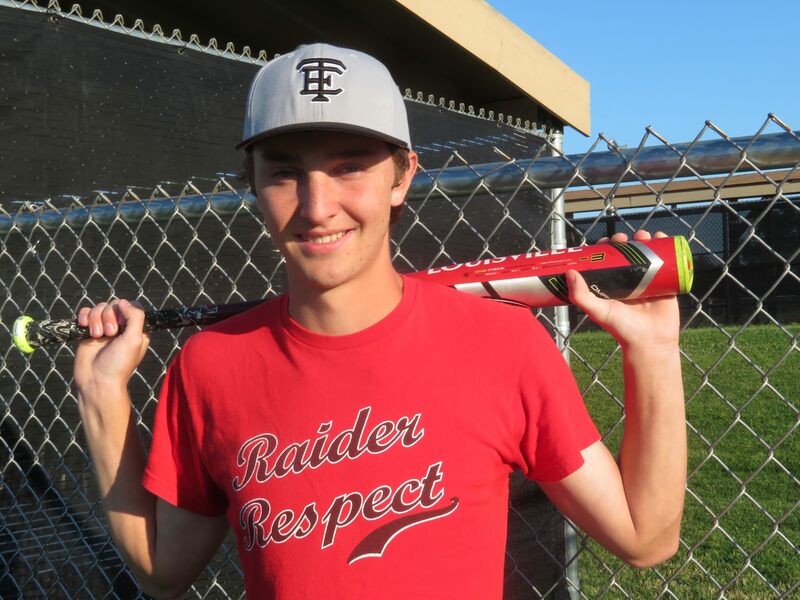 Mason began his baseball career on a softball diamond as a kid, as his parents (Scott, Sarah DeYoung) got him in a league with some friends before one of his neighborhood friends told him about the Tosa Baseball League (TBL). "And since I was doing pretty good in softball, I thought I might as well tryout in the Tosa Baseball League. Then I got put on the Sidewinders and I really liked my coach and from there I started doing more and more baseball." So why did Mason stick with baseball? "It's not contact. I played football for a bit, but I found that I'm not a contact sport kind of guy," he said. "I was also pretty good at it (baseball). There was a rough patch of questioning myself further. It's one of the few sports that I really still do. "Doing baseball was the best way to stay active. It's a really fun sport to get into. Once you know all the things about it, it's easy to stay with it." Mason has plenty of weapons to call on in his pitching arsenal. "I try to be a pretty accurate pitcher," he said. "I try to work with the fastball the most. I also have a slider that I use and that seems to come in handy a lot; and a curve ball. But I mainly stick with the slider. It has a little more power. I was also trying to work in the knuckleball (laughs)." Jeff also felt the mental part of his game is important to his success. "If we're in a game where I'm not doing well, I can still pitch (effectively)," he said. "I have a lot of confidence going out to the mound and just throwing strikes. It doesn't matter what situation I'm in, I have the same mindset. If I don't get a call, I wouldn't protest it quite as much. It's easy for me if I start off poorly to get back on track." Schwichtenberg pointed out Mason's role for the Red Raiders this season. 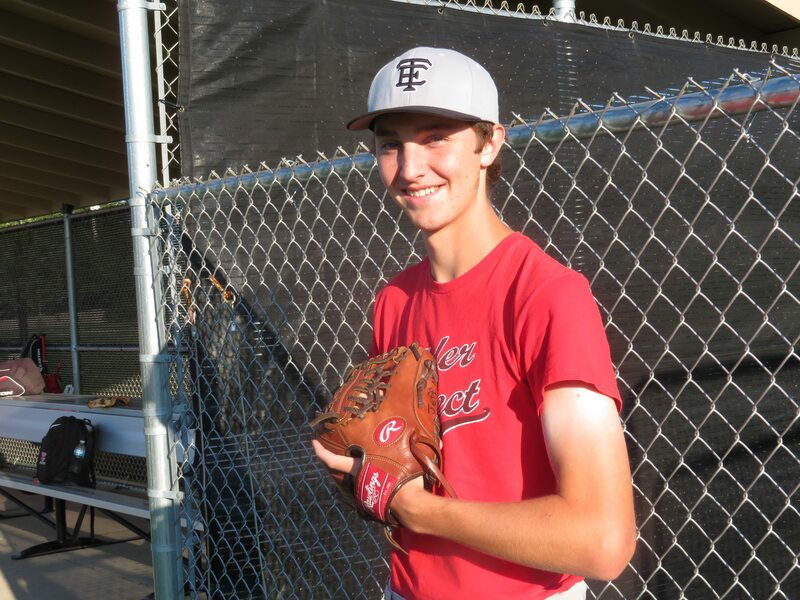 "He is one of our two aces along with Aaron Plaisted," Schwichtenberg said. "He's a guy when we set up the conference games we made sure when we faced some of the better teams when he pitched and he kept us in every game. He had a 0.64 ERA in conference games. He's our guy who is our ace and that's his big role on the mound." Schwichtenberg likes Mason's attitude on the mound. "He attacks hitters," he said. "He doesn't get behind. Everything he throws moves. Guys don't square up the ball against him. He wants the baseball." But Jeff is more than just a good pitcher to the Red Raiders. He also brings a big bat to the middle of the order. "In the lineup, he has hit anywhere from third through fifth for us," Schwichtenberg said. "He's right in the heart of the lineup. He is starting to get hot again. Near the middle of the year he was starting to wear down a little bit, but he got hot again (at the end of the year).
" As a hitter he drives the baseball. He hits basically to the left side, he ropes everything. Just being able to keep the ball on a line, he finds gaps. He's been able to do a lot lately, where earlier in the year he was hitting balls right at people." Mason talked about his hitting style. "I can drive the ball pretty far," the 6-foot, 1 inch 165-punder said. "I'm usually pretty aggressive at the plate. even if it's pretty early in the count I will still go for it. Sometimes it comes back to bite me a little bit (laughs). Most of the time that's (being aggressive) a strength." When he's batting, Mason doesn't try to think like a pitcher. He's gotten in trouble that way. "It's difficult. I tried to do that a little bit, but I found that didn't work," he said. "I'm not very good at guessing what pitch is going to come. So I just try to put myself in the position as a hitter and not try to put myself in a position of what the pitcher's thinking." Early in the season, the Red Raiders used Jeff in the field. "He plays some third and second for us," Schwichtenberg said. "Lately we've been keeping him as DH so we can keep his arm as fresh as we can, especially in the playoffs if we would need him in a game later. He played second a lot more last year, but he's been at third more this year." Photo by Tom "Sky" Skibosh --- Jeff Mason hit in the middle of the Red Raiders' batting order, leading the team in RBIs and doubles. With another year to go next week, both Schwichtenberg and Mason know he has things to work on. "I want to get more first-pitch strikes and give up less walks," Jeff said. "Basically become more accurate. Since I have the speed on a fastball I just need to get it in the strike zone more and be more aggressive that way. "As a hitter I would definitely like to work on off-speed pitches, being able to hit curve balls. I'm mainly a pull hitter, but I've done a lot of work that if I need to go opposite field if I can. But for the most part I'm still a pull hitter." Schwichtenberg sees a change in position for Mason next year. "Defensively, we may have him at first, working on some things footwork wise," he said. "His plate work needs some consistency. When he squares up, he hits the ball harder than anyone we've got. Hopefully that consistency will carry throughout the whole year. "On the mound, he needs to just keep doing what he's doing. Just pound the strike zone. They don't square the ball up against him a lot." Schwichtenberg pointed out that Mason will be a captain next year, but he has already been doing some leadership duties this past year. "During the off-season he was leading a ton of things like letting people know what we were doing," Schwichtenberg said. "He definitely leads by example, but he's becoming more vocal as well. He's going to be one of our captains next year. He's already shown that now - especially when we were going through some of the tougher times. He's the guy that would speak up and say let's get things back together." Mason looks forward to the responsibility next year. "It's a pretty big deal like I think back to when I was a freshman and people needed some guidance," he recalled. "So if I can help freshman and the younger players get into baseball more and also develop their confidence when they're out on the field I think I would succeed as captain. "I try to say what needs to be said. If we're in a bad situation and the team is down on each other, it is important to let them know they are down on each other and we have to snap out of that." Although the Red Raiders had a disappointing season (7-23), winning two Greater Metro Conference games, they won three of their final four games, won the regional title and lost to Marquette, 5-2, in the sectional semi-final. Mason was 2-2 with a 1.35 ERA overall in 41.1 innings, but he was outstanding in GMC play with a 0.64 ERA, which earned him honorable mention honors. He was second-team as a sophomore. At the plate, he hit .256 with a team-leading 7 doubles and 15 RBIs. FAVORITE MOVIE: 'Good Will Hunting,' Action & Drama. MOST MEMORABLE MOMENT: Beating Brookfield East, 3-1, for the only GMC win in his sophomore year. WHAT DO YOU WANT TO DO IN THE FUTURE: Attend college, major in Creative Writing and play baseball.